We’re proud and excited to be considered for your next home sale! 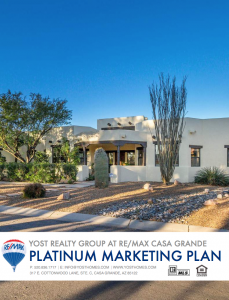 Linked here, you’ll find the Yost Realty Group at RE/MAX Casa Grande “Platinum Marketing Plan,” which will walk you through our process, our competitive edge, and our guarantee. We’d be more than happy to answer any questions you may have—just email info@yosthomes.com or call 520-836-1717. You can also click here for a free, automated home estimate!